Through Adama’s visions in the memory machine, Apollo and Starbuck relive a pre-massacre adventure aboard the Galactica. 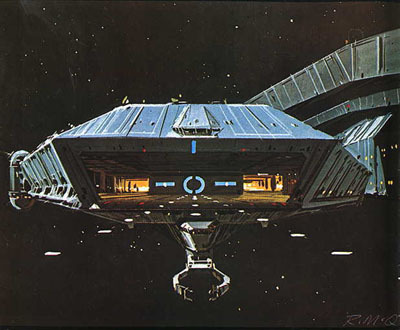 The Galactica detects a planet-sized object moving through deep space. Apollo and Starbuck are on patrol and sent to investigate. They discover a strange, organic planet and set down upon it to plant bio-recorders for observation. Apollo is attacked by plant-like tendrils until Starbuck shoots the stem. The two quickly plant the recorders and head back to the Galactica. But, as they're about to go through decontamination on the hangar bay, Starbuck's face breaks out in swollen red nodules, followed by Zac. As the plague begins to spread, the Galactica's doctor discovers that the disease is not a physical contagion, but appears to be transmitted telepathically by its vector, Apollo, in a decon room. To make matters worse, three Cylon base ships have been detected, pursuing the battlestar, while the planet is somehow moving close to them as well. Adama makes the decision to channel most of the ship's energy into one furious blast at the planetoid to keep it away from the Colonies...even though this will leave them helpless before the Cylons. Suddenly, Apollo, sleeping fitfully in his decon room, awakens and breaks out of the room, making his way to his Viper and blasting off for the planetoid. Landing, he finds himself following the orders of a disembodied voice in his head. As the baseships arrive and Cylon Raiders attack the Galactica, Adama orders the powerful laser blast to be fired at the planetoid, but the controls won't respond. Gigantic tendrils from the planet begin to reach out toward the Galactica as the battlestar finds itself trapped between the planetoid and the Cylons. Vipers are launched to combat the Cylon Raiders. Then the planetoid's gigantic tentacles reach past the Galactica and wrap themselves around the basestars, slamming them all together in destruction. The voice makes mental contact with everyone on the ship and explains that it is the living planet whom they mistakenly feared. The cosmic being simply hungered for some brief companionship and the symptoms experienced by Starbuck and the others were simply temporary manifestations of its attempts at telepathic communication. Adama is shaken by the knowledge that he misjudged the entire situation. As the flashback story ends, in "present time", Apollo comments that he remembers the events of the memory they just witnessed and that Adama was haunted for yahrens by his mistakes during the incident. The cover of this issue is rather misleading, in that it depicts the living planet acting in a more obviously destructive manner than it does in the story. Page 2 describes the Viper scouts, returning from patrol, entering the landing bay and being automatically cleaned and decontaminated by sonic waves. I assume this decontamination procedure works only on equipment and not on the pilots themselves since they are seen going into decon rooms in "Into the Void". On page 5, panel 7, Starbuck's Viper has his name and rank inscribed just below the seal of the cockpit canopy. On page 7 Apollo and Starbuck set down on the planetoid and hop out of their Vipers. This points out a habit throughout Battlestar Galactica, of the characters walking around on strange, unknown worlds without apparent concern for natural biological agents that could be sources of infection. Since Apollo says they are supposed to implant it with bio-recorders according to procedure, you'd think they'd have probes stored in the fuselage of the Vipers that they could just drop on the surface. Since Apollo states on page 6 that there is no sun for the planetoid to orbit, how is that it appears to be fairly bright when they land on it? And how is it warm enough for them to walk around on the surface without spacesuits? 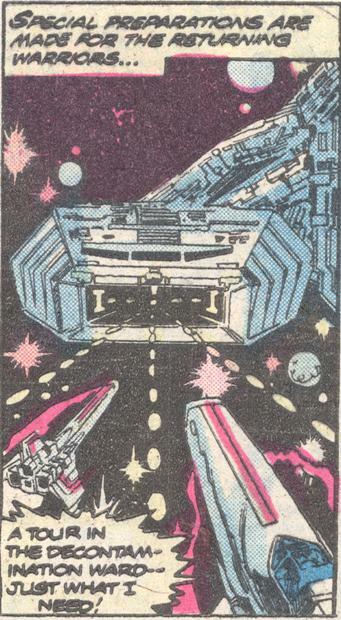 On page 10, panel 7, the Galactica's name is missing from the exterior of the hanger bay. On page 11, panel 2, artist Pat Broderick has borrowed a concept from Ralph McQuarrie's early production painting of the hangar bay, showing a Viper's targeting hairs guiding the pilot in for landing. As the Cylon baseships are destroyed by the living planet, the commander of one of the ships is seen and he looks like the Imperious Leader! Since this story was a flashback to before the massacre of the colonies, was this an earlier Imperious Leader who was killed, to be replaced by the one seen in throughout "Saga of a Star World"? By the end, we realize the title of the story, "This Planet Hungers", refers to hunger for companionship, not sustenance. As the flashback story ends, in "present time", Apollo comments that he remembers the events of the memory they just witnessed and that Adama was haunted for yahrens by his decision that nearly ended the living planet's life. It seems like a stretch to say that it could have happened yahrens ago...all the characters we see are stationed on the Galactica and still in the same positions with the same rank, Captain Apollo, Lt. Starbuck, Zac at whatever rank and still not a pilot, etc. It seems one yahren (or 2 at the most) would be a better figure. What happened to the planetoid after this story?